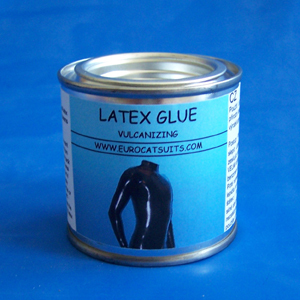 This is vulcanizing glue we use for making our latex clothes. Designed especially for gluing natural latex. This adhesive has a vulcanizing feature, where the molecules of glue create extremely strong bond to latex. Great for repairing damaged or making new latex clothes. Creates very strong, water-proof, flexible seams. The glue comes in 100ml or 375ml tins with wide lid for easy access. It is ready for use and does not need to be thinned up for application with a brush . For gluing the zipper to latex you will also need our zipper glue. If you want to attach the zipper to the latex ( we also sell zippers - unlimited length of one piece ) , you will also need the zipper glue . The instructions how to glue the latex can be found HERE.